A couple of days ago one of my students walked into class proudly brandishing his new metal water bottle. Last week we had focused on waste production, harping a bit on single use plastics. Until this week that student had been bringing a single use plastic water bottle to school every day, maybe even more than one. I told him that is a great step, that every little bit counts. And it really does. On average, the production of a single use plastic water bottle emits 2.19 pounds of carbon dioxide (extrapolated using Gleick and Cooley 2009 and www.carbonfund.org). Imagine that my student has used one single-use bottle every day he has been in high school so far. That’s roughly 674 school days. His choice of using a single use plastic water bottle for all of those days would have resulted in 1,476 pounds of carbon dioxide to have been released into the atmosphere. And that would be for school days only, and during his high school years only. Imagine the lifetime numbers! Now think about this: roughly 1,000,000 single use plastic bottles are purchased every minute all over the world (The Guardian). That’s 2,190,000 pounds of carbon dioxide just for the bottles purchased in one minute. Humans have developed a terrible addiction to plastic and the climate implications are staggering. Pile on top of that the fact that most plastics are not recycled. They end up in landfills and the ocean. I could write for DAYS on the effects of plastic on marine ecosystems and human health, so stay tuned for that. Having your own reusable (preferably ceramic or metal, I like stainless steel) does make a difference and it’s so easy! If you don’t care about environment (which I’m sure is not true if you are taking the time to read this blog) at least think about your health. Harmful compounds leach from plastic into the liquids or foods that they are holding. Even if a bottle says BPA-free, it’s still full of bad stuff. More to come on that later, too. I’ve been talking about waste, recycling, and composting with my students this week. Every year when I cover this topic I am shocked at the numbers, this year is no different. According to the EPA we collectively generate over 260 million tons of waste every year in the United States. Food waste is 16% of that total and only 0.8% is composted. Mini-science lesson: When food waste is composted properly it is turned over frequently to provide aeration to bacteria which need oxygen to use the food waste as their own food source. This process creates carbon dioxide (just like we do when we “burn” our food) and fertile soil. When food waste is sent to a landfill it decomposes in a very low oxygen environment (there’s no turning over of a garbage dump). The bacteria that function in a low oxygen environment produce methane instead of carbon dioxide. On a short time scale (20 years), methane traps approximately 85 times more heat in the atmosphere than carbon dioxide (EPA) and on a longer time scale (100 years) methane traps approximately 32 times more heat than carbon dioxide (EPA). I moved into my house in the summer of 2017. For the previous decade I had just been throwing my food waste into the wooded area behind my condo building, usually early morning before my neighbors were up and able to complain about it (we had lots of wildlife that we were encourage not to feed, so I had to be covert). Without food waste and with recycling lots of things, we ended up throwing one small bag of garbage out every month instead of a bag every week. It was great. When we moved to the house, I wanted to start composting but was a bit intimidated by the work to actually do it right (building a compost bin, turning it over frequently, getting the right balance of materials, etc) and I was already overwhelmed by the move itself, all the things that needed doing around the house, and yard upkeep. I definitely did not want to just throw food waste in a corner of my yard and I’m not a gardener, so compost is not something that I need in my life. Imagine how excited I was to find out that we had inherited participation in a curbside composting pick-up trial our town was running. I was thrilled to start “legit” composting with the town. This fall the trial ended but service continued seamlessly with a private company. Now we have to pay to compost (but it works out to less than $2 per week) but they take more stuff, like pizza boxes, tissues, hair/pet fur, etc that you can’t recycle and would normally go in the trash. So now, between composting and recycling, we generate a small “kitchen” bag of waste every 3-ish months. OK. Refer to the mini-science lesson above. Landfills create lots of methane, which traps way more heat than carbon dioxide. Anything you can do to reduce the amount of stuff you send to a landfill will help to reduce methane emissions. Composting is a huge part of that because it makes up a significant percent of waste in landfills. Project Drawdown has identified food waste reduction as one of the top 5 things to work on (along with plant-based diets!) to reduce the amount of greenhouse gases in the atmosphere. This puts reducing food waste ahead of solar and other renewable energy sources as solutions. Check out if your town/city has curbside composting or a town drop-off site. If you live in the Boston Metro area, check to see if Black Earth Compost picks up in your town, if it doesn’t, approach your town sustainability coordinator or waste management division and encourage them to check it out. Composting actually saves towns money. Sending things to a landfill is much more expensive than composting, which can actually make money because people will pay for compost for their gardens. Like I’ve said before, motivation is often linked to money, which I’m ok with if it encourages people to do the right thing for the environment. I’m not a big fan of nuclear waste. I feel I should say that up front so I don’t get a bunch of comments from those who are staunchly opposed to nuclear energy. ​ There is mixed news on the energy front. Today is the 40th anniversary of the Three Mile Island nuclear plant’s partial meltdown. This event caused a major backlash of public support for nuclear energy in this country. This decline in popularity was reinforced by the Chernobyl complete meltdown in 1986 which rendered the surrounding area unsafe essentially forever and caused a plague of cancers and birth defects still seen today. NPR ran a story this morning about the eminent closure of the Three Mile Island plant. The partial meltdown released small amounts of radiation to the atmosphere, double a person’s normal dose of radiation for a day (yes, we are bombarded by radiation all the time! From space, from the ground, from things of our own making like cell phones…). That release of radiation was nowhere close to the scale of Chernobyl and research has not found any adverse health correlations. On the plus side, the partial meltdown on March 28, 1979 led to stringent safety measures and system of checks for nuclear energy plants. To reiterate, I’m not a big fan of nuclear waste (I don’t think we have the capacity as a species to keep it safe forever, but that’s a whole other post...some day, maybe). I am also not a fan of nuclear meltdowns. I am, however, a fan of energy production that does not release carbon dioxide into the atmosphere. If we start to shut down all of our nuclear energy plants the likely successor for electricity production is natural gas. In my opinion, we should not shut down nuclear plants until we have wind and solar in place to fill those energy needs. Closing existing nuclear plants and replacing them with fossil fuel burning plants will be a major leap backward in the fight to slow the warming of our planet. My two cents. ​ That being said, I was happy to see a report released last week with the news that the US has doubled renewable energy electricity generation over the past decade. More good news: CNN reported that the cost of wind and solar is dropping so rapidly that coal will likely be outcompeted in many markets in the next decade. I think this is really the key point. Once it becomes cheaper to produce and buy wind and solar, fossil fuels should (according to the rules of capitalism and the free market) get phased out by the market. Unfortunately we can’t rely on (most) people to just do the right thing. They have to be motivated and it has to benefit them. It all comes down to money in the end. On a related note, last week I e-mailed all my town Selectmen/people to encourage them to increase require our town electricity provider to increase the renewable energy content to 10% from 5%. I was pleased to get a response from one of the Selectwomen who thanked me for offering specific suggestions (I recommended increasing to 10% and then each year increasing that by 1-2%, following the model set by the Massachusetts legislature with their Renewable and Alternative Energy Standard programs.). It was nice to get a "real" response. This is so different from the canned or nonexistent responses from senators and representatives, both state and federal level. Little digression story here. A few weeks ago I e-mailed a senator to vote for some legislation and I received a three page e-mail that detailed policy on something completely unrelated. Obviously a copy/paste/send job by an intern. Anyways, the personal response from my town selectwomen really made the motto "think global, act local" hit home. So I encourage you to get involved locally. You could make a difference in policy, especially if you encourage your neighbors to speak up too. Maybe people are not too worried about climate change yet because a warmer world sounds great in the midst of a New England or Midwest winter. I recently came across a study by the Pew Institute that found most people prefer living in a place with a warmer climate. Hence all those retired snow birds who migrate down to Florida for the winter from the northern ranges of our country. Save one winter I spent in England (the original) I’ve suffered through New England winters every year of my 40+ years, relishing the random 50°F days here and there but mostly complaining about the cold, and the snow, and, this year especially, the freezing rain. I hate winter but I will grudgingly admit that it makes summer all that sweeter. Plus winter provides tourism jobs year-round in rural areas with ski resorts and winter provides just the right conditions for maple syrup. What would pancakes be without maple syrup? You think about that. I think many of us can agree that the majority of people in this country spend little time thinking about climate change let alone taking actions to reduce their greenhouse gas contributions. So my question is, when Southern Florida is gone because of sea level rise, where will everyone retire to? Will Massachusetts be the new Florida? My father jokes about having beachfront property on Cape Cod in a few decades (they live more than a few miles uphill from the beach). He might be off by a century or so, but it’s not out of the realm of possibility. ​ A warmer world has lots of consequences. I’d prefer my winters to stay freezing if it means that our economy will not collapse, millions of people will not be displaced by sea level rise, and maple syrup can still be made in New England. Trade-offs. Oh, if maple syrup is something you can live without, contemplate a world without chocolate, coffee, or avocados. Are you worried now? Here is a place to start for ways to reduce your personal greenhouse gas contributions. Yikes! I calculated my carbon footprint as an exercise with one of my environmental science classes and realized that despite my driving a hybrid vehicle, my car-based footprint is really big. Driving to the fitness studio five minutes from my house a few days a week really adds up and piles on to my 22-mile round trip commute to work. Home energy use was my second biggest carbon contributor. Having made the move a couple of years ago from a small condo to a single family home increased my energy use quite a bit. On the plus side, my 25+ year vegan diet has a much lower carbon footprint than that of an omnivore or heavy meat eater, and it’s even significantly lower than that of a vegetarian. What I have learned during my nearly decade of teaching about climate change and other environmental issues is that a vegan diet is the best thing you can do to reduce not only your carbon footprint, but your overall impact on a wide range of environmental issues (habitat loss, eutrophication, water pollution….the list goes on) not to mention the potential to solve food shortage issues. The Guardian has a great summary article, but there are lots of peer-reviewed scientific reports that provide data to support this. 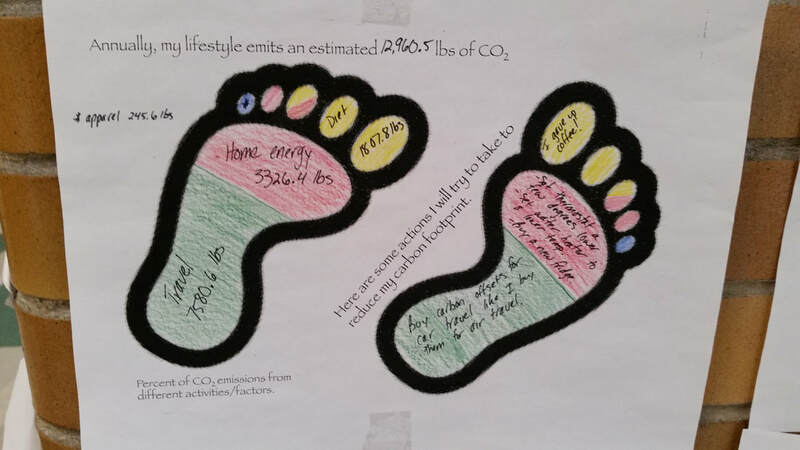 I asked my students (and myself) to come up with at least one action (daily, weekly, yearly…) that they could reasonably take to reduce the amount of carbon that each sector of their lifestyle contributes to the atmosphere. As a group we examined diet, home energy use, transportation, and apparel. Some of them took it more seriously than others of course, but I took the opportunity to survey my own lifestyle. Rarely buy produce from outside of the U.S. So far I’ve turned the water heater down. I actually I think I can turn it down even more. I’m going to experiment with it. And just yesterday I bought a second clothes drying rack, so I’m on track for laundry air drying. The refrigerator is on a list of things to do for the house (it’s never ending!) and will probably happen during a kitchen makeover. "The Scientific Integrity Act was introduced to the House and Senate on March 13. As your constituent I urge you to co-sponsor this important bill which gives government-employed scientists the right to share their research with the public, ensures that government communication of science is accurate, and importantly, prohibits any government employee from censoring or manipulating scientific findings. We are at a critical point in our fight to reduce the future impacts of climate change. The current administration is taking leaps and bounds backwards across the board in issues related to the environment. This country and the world needs the U.S. government to start taking the advice of scientists instead of fossil fuel executives." If you also feel strongly that the government should not be able to censure scientists but instead listen to them, please contact your own legislators. The 3-day Climate Reality Leadership training I just attended in Atlanta, Georgia has lit a fire of motivation and provided the impetus for me to share my own journey to reducing my carbon footprint. Over the course of those three days at the training, my cohort of 2000+ attendees heard from scientists, community activism leaders, inspiring youth, and of course Al Gore (or AG as someone referenced him as on day 3). I came away with a lengthy list of things I can do to spread awareness about the climate crisis and, in some small way, instigate changes. I went to the training because I’ve been teaching about climate change for nearly a decade now and every year I feel more pessimistic about the direction we are going. I needed some hope and motivation. I certainly got it. I was also happy to see that most food served was vegan (everything was vegetarian, but it would have been nice to go 100% vegan...a plant-based diet is one of the most important actions an individual can take) and served on real plates with real silverware and real cloth napkins. Reducing waste was a major goal of the organizers and an important model for the attendees. The total carbon footprint for the training was calculated and offset. It was my first visit to Atlanta. I ate at a great vegan restaurant, Herban Fix. I highly recommend it if you are in that area. I was happy to find it was only a 10 minute walk from my hotel. The training was located in the World Congress Center, which was about a 20 minute walk from my hotel in the other direction. I was happy to not have a transportation carbon footprint for a few days (minus the flight of course, and that was a big one! I decided to offset my own flight using www.carbonfund.org.) I didn’t have a lot of time for sightseeing, but I did manage to visit the National Center for Civil and Human Rights. The experience was emotional to say the least. The staff there were great. One woman asked me if I was doing ok and gave me a hug. 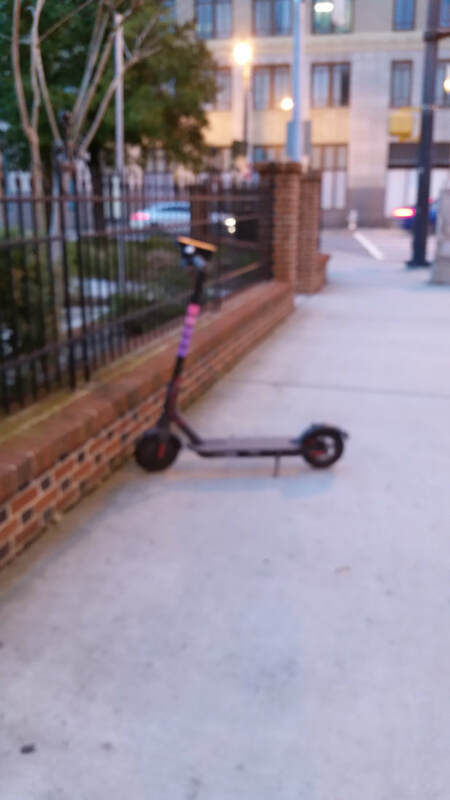 One thing that really struck me about Atlanta was the prevalence of electric scooters everywhere. Literally everywhere. Left in the middle of sidewalks. Randomly strewn about parks. Sometimes parked neatly off to the side.I love the idea of people being able to use a lower impact form of transportation and that it is readily available, but stepping over scooters as I was walking down the sidewalk threw me off a bit. Disclaimer: the views I express in this blog are mine and are not representative of the Climate Reality Project. Thoughts and stories about my journey to lower my environmental footprint and raise my voice.